Each year the Arizona Diamondbacks invite the local Phoenix area fans to a fan appreciation day. They call it Fan Fest. There are autograph sessions, photograph sessions, radio broadcasts, giveaways, shopping and more. Don't forget the pitching, hitting and fielding clinics for the kids! In 2019 the Arizona Diamondbacks will hold Fan Fest on Monday, February 9th from noon to 4 p.m. Season ticket holders will be able to enter an hour earlier, at 11 a.m. Fan Fest will be held at Salt River Fields at Talking Stick in Scottsdale. There is no charge to park.Admission is free. All activities are free. Autographs, concessions and purchases of memorabilia or team shop items, of course, have a charge. The following people are currently scheduled to attend: Nick Ahmed, Jake Barrett, Archie Bradley, Sócrates Brito, Enrique Burgos, Andrew Chafin, Patrick Corbin, Rubby De La Rosa, Randall Delgado, Brandon Drury, Zack Godley, Paul Goldschmidt, Zack Greinke, Chris Herrmann, Chris Iannetta, Jake Lamb, Evan Marshall, Ketel Marte, Jeff Mathis, Shelby Miller, Chris Owings, David Peralta, A.J. Pollock, Robbie Ray, Fernando Rodney, Braden Shipley, Yasmany Tomás and Taijuan Walker. Coaches expected to participate include Manager Torey Lovullo, Bench Coach Ron Gardenhire, Bullpen Coach Mike Fetters and Quality Control & Catching Coach Robby Hammock. 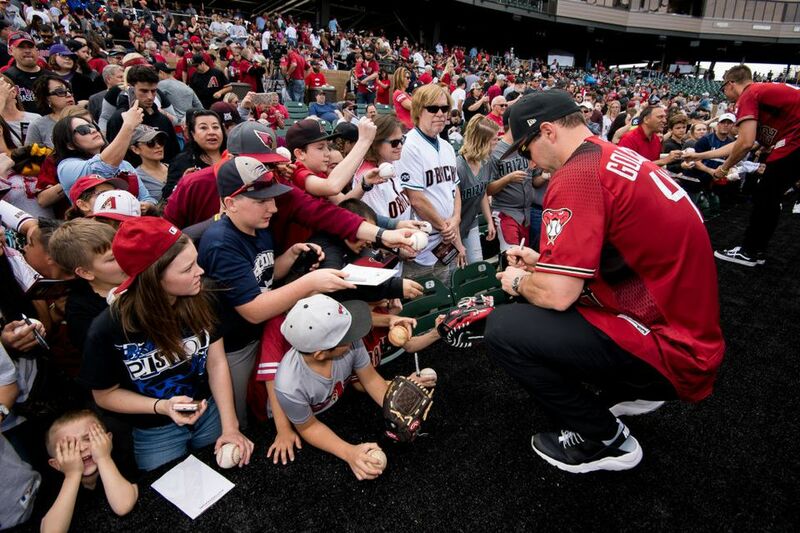 Children 12 and under will receive free autographs in a special area, while others can receive access to autograph sessions with a donation to the Arizona Diamondbacks Foundation. A limited number of autograph session vouchers will be sold. Proceeds of the sales of the vouchers always go to the Arizona Diamondbacks Foundation. The voucher system for autographs has restrictions and can get complicated, but it is intended to make it fair for everyone. This event is about the fans, not dealers or people trying to make a quick buck. Session A: 12:15 – 1 p.m. Session B: 1:15 – 2 p.m. Session C: 2:15 - 3 p.m. Session D: 3:15 - 4 p.m.
D-backs Season Ticket Holders will have the first opportunity to purchase autograph session vouchers online. All D-backs Insider e-mail subscribers will also have a special online presale opportunity. All autograph session vouchers purchased online can be picked up at Season Ticket Services Headquarters located near the third base ticket office at Salt River Fields. Fan Fest is free to attend. It's an appreciation day for the Arizona Diamondbacks fans. You'll probably have to pay for parking, This location is NOT accessible by Valley Metro Rail. At the D-Backs Fan Fest some of the players and some of the coaches will appear to sign autographs and pose for photos. Bring your camera! Get to Fan Fest early — in previous years about 25,000 people showed up at the event! Once the vouchers are sold out, no other ones will be issued and you won't get those autographs. Bring your own caps, shirts, baseball cards and autograph pen. Otherwise, players and coaches will use their own glossy photos to autograph for you, no extra charge. The Team Shop is open for Fan Fest. There are vendor booths set up where you can purchase collectibles and baseball memorabilia. Outside, weather permitting, wiffle ball fields with D-backs Baseball Academy will be set up where kids have an opportunity to participate in basic clinics. Batting cages will be open for fans to test their skills. For more details about D-backs Fan Fest call 602-462-FEST (3378) or visit the D-backs Fan Fest online. So Many Pro Ball Players in One Place. Get Your Sharpie Ready!